With the vast majority of 2018 in the books, how did the apartment market fair in 2018? In most ways, 2018 was a good year for apartments. Rents are up over the past 12 months, per unit and per Sq. Ft. values are up, cap rates are down, though vacancies are rising. As of mid-December 2018, we've exceeded 2017 in both sales volume and number of transactions. YTD 2018 annualized construction permits are down 30% from 2017, though it will still be a top 5 busiest year of all time. 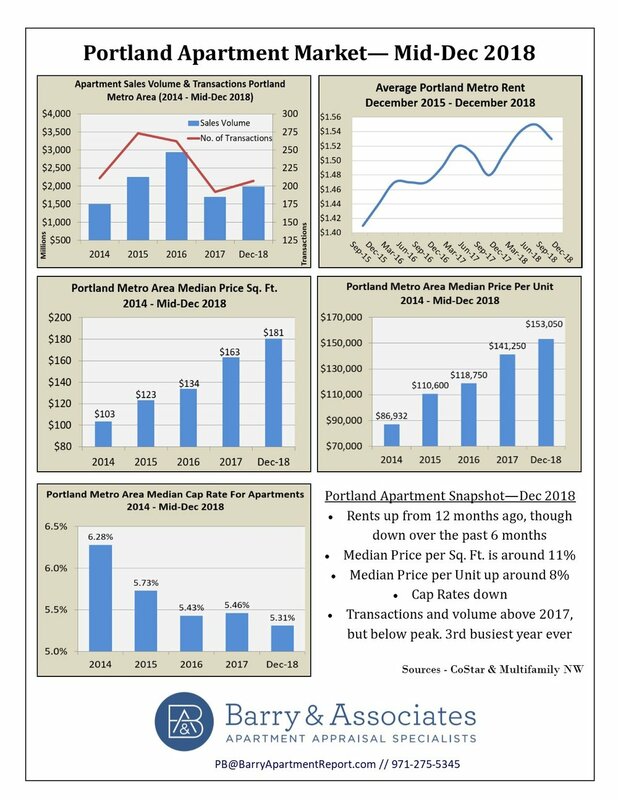 Sales of properties in Multnomah County accounted for 67% of all transactions. As of mid-December 2018, Clark County and Clackamas County only saw 12 and 16 sales, respectively, both down from last year. Posted on December 19, 2018 by Patrick Barry.